cheatmode - Access the hidden cheat menus of the game! Have an addon you wish to share? Post addon releases here. cheatmode is an addon that enables the cheat mode menus of the game. 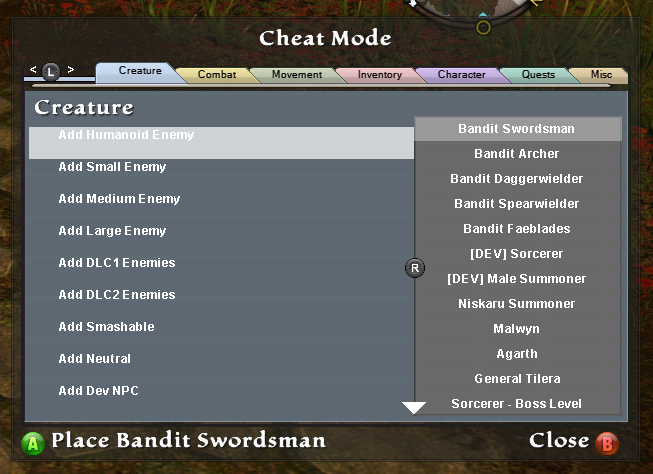 This addon modifies part of the game's memory that fakes it into thinking it is a different version of the game, allowing the cheat menus to be enabled and work. /cheatmode on - Turns cheat mode on. /cheatmode off - Turns cheat mode off. How to access and use cheatmode? There are two ways to use the cheat mode menu, either with your keyboard, or with a controller. F1 - Opens the cheat mode menu. Left/Right Arrows - Navigates between the cheat mode tabs. Up/Down Arrows - Navigates between the left-side menu options. Numpad0/Numpad1 - Navigates between the right-side menu options. Enter/Numpad Enter - Selects the highlighted cheat option. Dpad Down - Opens the cheat mode menu. Dpad Up/Dpad Down - Navigates between the left-side menu options. Left Thumbstick Up/Down - Navigates between the left side menu options. Dpad Left/Right - Navigates between the cheat mode tabs. Left Thumbstick Left/Right - Navigates between the cheat mode tabs. Right Thumbstick Up/Down - Navigates between the right-side menu options. A Button - Selects the highlighted cheat option. B Button - Closes/backs out of the cheat menu. Re: cheatmode - Access the hidden cheat menus of the game! Some other notes about cheat mode. This half-enables some of the developer mode menu options at the main menu. You will see new buttons at the bottom and a new menu option called 'Internal'. At this time, these options do not work properly and instead just cause the game to die in a never-ending load screen. In-game, the cheat menu has several unused/dead menu entries as well that can cause the game to get stuck, break your current quest, crash or otherwise have other unwanted side effects. It is super important to not use cheat mode on a game save you care about until you understand what you are doing! It is also a good idea to backup your saves before messing with things. Hello. i want to use the cheatmode but i am total noob at this.what files i need , where do i need to place the files inside rmod and what command do i need to use them ? Place this in the same folder as the main rMod exe and dll. And it can be used to install the known addons and keep rMod up to date. My rMod folder now contains addons subfolder. I start game via rMod exe, and get proper message in game. BUT i can't use commands provided in addons like /fps show or /cheatmode on, i get "unknown command: /cheatmode response. What should i do to make this work? Am i missing some steps?